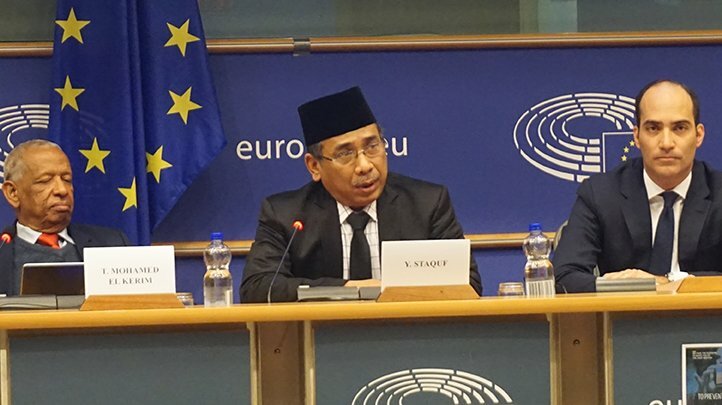 EUROPEAN PARLIAMENT, BRUSSELS: On January 31 and February 1, 2019, Kyai Haji Yahya Cholil Staquf—General Secretary of Nahdlatul Ulama (NU), the world’s largest Muslim organization, and Emissary of Indonesia’s largest Islamic political party, PKB—led an official delegation to address the European Parliament’s center-left and center-right political groupings at the invitation of Portuguese Socialist Party MEP Ana Maria Gomes and the United Nations Interregional Crime and Justice Research Institute (UNICRI). Visiting in his capacity as a member of Indonesia’s Presidential Advisory Council, with a protocol rank equivalent to Minister of State, Mr. Staquf delivered a heavily-attended speech urging Europe’s centrist politicians to halt the rapidly accelerating polarization of European societies by acknowledging and addressing legitimate concerns raised by populist forces about the nexus of national and international security threats linked to Islam, terrorism and migration. 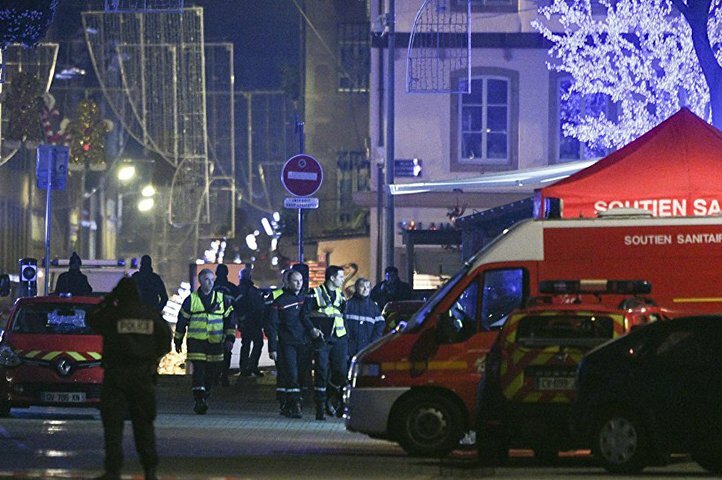 On December 12, 2018—the day after an Islamist attack on the Strasbourg Christmas market, whose highly symbolic target selection evidenced a clear religious motivation—the European Parliament adopted a “Report on Findings and Recommendations of the Special Committee on Terrorism,” with 474 votes in favour, 112 against and 75 abstentions. MEPs Monika Hohlemeier (EPP) and Helga Stevens (ECR) served as co-rapporteurs, with substantial input from Ana Maria Gomes (S&D). This report addressed the issue of religious extremism—also described in the report as ‘Islamist extremism,’ ‘Radical Islamic Fundamentalism,’ ‘Wahhabism,’ ‘Salafism’ and ‘jihadism’—with unprecedented clarity, regarding both the nature of the threat and measures necessary to prevent Islamist terrorism. 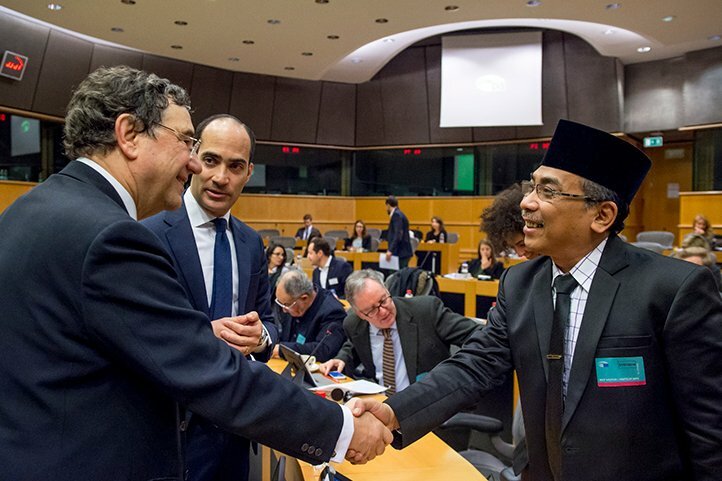 Mr. Staquf’s Brussels visit is part of a systematic effort by the spiritual leadership of the Nahdlatul Ulama—who are spearheading a global Humanitarian Islam movement—to expand the range of acceptable political discourse about Islam in Europe and to address legitimate national security threats, while tempering the dangers inherent within populism.